Here are some songs and poems I have written over the years either based on IC's books (mostly Ober and LS) or with related themes. 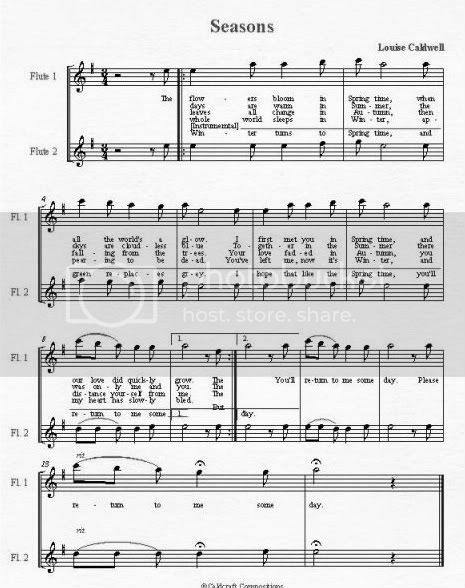 Most of the songs have at least a rough tune, I will create links to sheet music as I finish writing it out. Also, while most of the pieces are rather depressing (try 'all' and 'very' |:| ), that is totaly due to the characters/books, and in no way reflects my state of mind. This a song I wrote specifically about Elspeth's quest and her reaction to it, particularly at about the end of Ashling. Although she does not know about the quest untill the end of Obernewtyn, she always feels different. A song about Iriny just after Elspeth has stopped her from dying/suiciding. Lyrics are inspired by and based on a song found in the Ship Who Sang by Anne McCaffrey. You will not let me follow, why? A poem I wrote several years ago based on Ashling. More recently addapted to fit the dreamtrails in TKP. I used the original chorus, and wrote the verses based on various themes and images found mainly durring the segues, rather than using the story given. Will you tread the moonpath? Will you sing the lost soul home? This song is about Dragon while she is in her coma, and Elspeth and everyone else trying to get her to wake up before her mind is walled off completely. Some verses could also refer to Rushton after he has been tortured by Ariel. Can you hear me calling to you? This next poem connects the comet in LS with the return/freeing of the Unykorn. 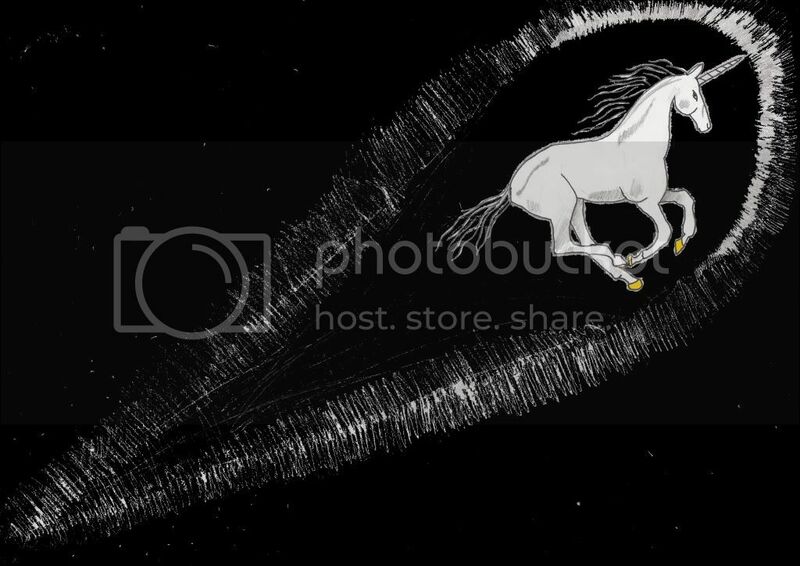 It was based on a picture I drew (Return of the Unykorn) and was originaly supposed to be longer and in a different format, but was changed so I could use it as a sig. Originally written for the acrostic poem competition, this poem looks at the feelings of Glynnn and Solen before and after the fieinna-link. Although not related to any of IC's books, I wanted to include this here. When reading the book (and watching the movie) Ella Enchanted, it struck me that there is a much easier way of breaking the spell than through 'true love'. When Mandy and her mother realised the problems the curse would cause her, they simply needed to give Ella a carefully worded order, like the one below, to negate the effects. And can not be countermanded. This song fits the story of Kella and Domick's love. Written from Kella's POV, at the end of TKP/ start of TSK, it shows how their relationship blossomed then faded. You'll return to me some day. These next two poems are about Ember (LS) and her dieing. They use imagery and metophores to attempt to portray the effects her tumour has on her. This first one was written for the epitaph competition. It uses her name to portray her death as the death of a fire. Each stanza shows a different part of her life from her childhood, through discovering her tumour, to comming to Keltor and completing her destiny as the Unraveller. Shooting out sparks of song. A bed of coals glowing fitfully. This poem was written as an experiment with blank verse. It uses the image mentioned in the book of the knowlege of her death as a mountain, to show what is happening in Ember's mind between discovering her tumour, and accepting death and indifference. The world into deep shadow. And turned towards the mountain. And built a shrine on its slopes. I sing to you, my death. I tend to find a surprising amout of my Obernet stuff is actually about the Legendsong, as is this next one. I actually wrote this for my sister at a time when she was having trouble with her friends. (It's the fastest song I've ever written... I had to finish before they made up again!) Despite this, it actually fits in well with how Hella feels about Glynn when they meet on Fomhika. She believes herself betrayed and abandoned, and thinks Glynn was just using her and Solen before moving on to the Drakka. You pick me up, then throw me away. You change the rules every day. I am only there for you to play. That’s how it is, what more can I say? And you’ve no idea how it hurts me when it ends. I have had enough of your silly game. ‘Cause that’s all it was, I see it plain. I am leaving now; you’ve lost your claim. And there’s no-one but yourself to blame. You might think you’re always right. I’ve got to live my own life. You locked me up and took the key. You couldn’t bear for me to see. I can’t believe the lies you told me. But I will escape, I want to be free. Not my friend, not my friend. These next poems are not related in particular to any IC book, but are based on other books, or books themselves. This poem is about how you get caught up in a good story, and are unable to put a the book down until you finish it. Calling you throughout the ages. They began to weave a magic spell. Drawn to a place of other lands. And many adventures you must face. The power of words is no whim. Until at the end, out, you are hurled. This poem was written to describe the contradictions and magic of books. It includes several commonly used metaphors. You fall in love and save the world. Based on the Chronicles of Pern series by Anne McCaffrey. Still a bit of a WIP. 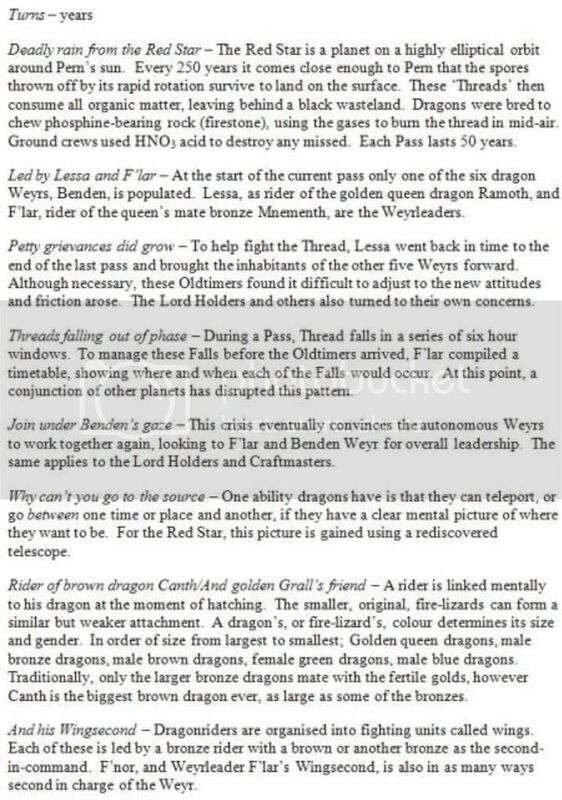 Craft-hall, hold, and dragon Weyr. Each prepares, as the star draws near. In the sky, a flash of fire. Thread falls, Pern’s need is dire. Thread falling from the Star. Like a star-spangled blanket, comes the night. With dragon eyes whirring, on fire height. This poem was inspired by a poem in Lord of the rings by JRR Tolkein. Amidst patches of shadow and light. Of what the future has to hold. A mystery in full view. The future that you want. That will help to smooth the way. You will travel a difficult road. This next is a song I wrote while first starting to read the second book in K.J. Taylor's The Fallen Moon trilogy. Each verse focuses on a different emotion; prejudice, betrayal, injustice, loss and scorn. I changed myself as much as I could. I gave you my trust, you told lies. My loyalty you used to break. Even my life now you take. But to try to strike back at you. What you drove me to do. Because of you I've lost my friends. Because of youI've lost my home. Because of you I'm alone. Are you really so surprised to see? I am what you've made me. I really like these. You have such a beautiful way with language. My favourites so far are 'the Paradox of Books' and 'Epitaph for Ember'. Have you got tunes for the songs right at the beginning? 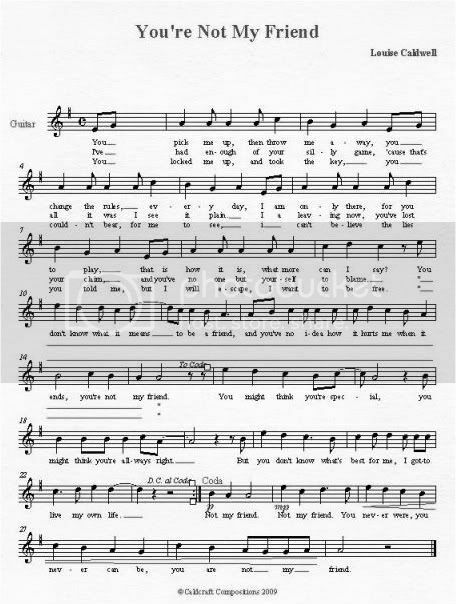 Most of the songs (and longer poems) have music. I'll try to put up the music as I finish writing it out (and working out the technical bits :| ). I've added sheet music for the first of my songs, Darkfall, Not My Friend and Seasons. I appoligize for any notational errors, it was a case of how do I show what it is supposed to sound like and still fit it on one page :-/. More music will follow as I finish writing it up and addapting it. This poem I wrote as an English assignment and is based on the Dragons of Pern books by Anne McCaffrey. It focuses paricularly on events in the second book, Dragonquest, and uses part of a song about those events from Dragonsinger:The Harper of Pern. Deadly rain from the Red Star. Led by Lessa and F’lar. Then disaster stuck, shocking all. Threads falling out of phase. One answer, only, to some. Taking the battle to them? Dragons flaming on the Star. Her life now life is gone. The winds of change would blow. To the Red Star they must go. He saw the star through distance viewer. A hand closing its fist. One man Pern could not risk. Said dragons do not fear. No touch but that of mind. Afraid of what they’d find. Of grey and heat and roar. Below, at last, they saw. Sand flays them to the skin. 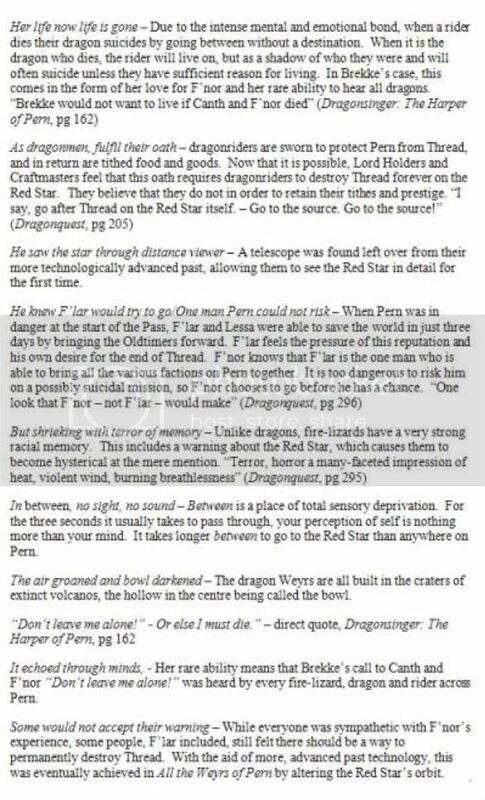 Dragons can’t go to the star. He must warn the Weyr! The battered pair did flee. Where Brekke did wait and call. A world heard that cry. They hovered close to death. But scars proved it was real. Taking the battle to them. Bringing Thread-falls to an end. Nice Biliophile. Though I haven't read the books, I can get a bit of the story from the poem. The issue I have with it is the metre. It flows really well in plasces but in others its a bit all over the place. How did it go at school? These next two songs are still only works-in-progress, but I wanted to put them up anyway. They both refer to fairly minor characters from the Legendsong Saga. The first song looks at Lanalor/Ronaal, and how helpless he is to actually do anything other than watch Glynn and Ember's struggles; even though it is his soul at risk. The first stanza is the chorus; I only have one verse so far. All he can do now. Now he must play his hand. Is resting on his plan. The second song explores Unys, and the fact that very little of her actuall character is revealed, mostly she appears to be a pawn for her mother. The idea for this song came from another character calling Unys a painted doll. More verses and the bridge to come. That is the part she sings. A pawn in another's game. That's how her Song is sung. I like your representations of the two characters, Bibli. They're not usually the ones people focus on, and the way you portray their emotions is really cool, for lack of a better word. I found though that the first stanza of Painted Doll flowed really well, but the second didn't. I might just have the tune wrong in my mind, or it may have meant to be like that? They're still both very nice pieces. Fate - I chose those characters precisely because they were relatively minor, and I wanted to see how they felt about everything. You are quite right about the second verse of Painted Doll, that is where most of the WIP stuff is. When I get a change to work on it more, I'll probably put the last line in a different stanza and edit the rest of it a bit. This song, I wrote based on the Wheel of Time series by Robert Jordan; the title is the same as the title of the last book (not yet published). Unlike most of my other songs and poems which are rather depressing, this talks about keeping hope even in the darkest moments. Cling to a memory of light. Cling to the memory of light. Remember the clear star-filled night. Remember the spring flowers bright. Hold them as shields in the dark. Cling to these memories of light. ooooo I love it! the only thing i might change.... i know you were trying for rhyme, but "Remember the spring flowers bright" Just kinda halted me, the flow changed, and the words were'nt exactly in english grammar, lol.... if that makes sense. Anyways, i love the rest of the song, when i read it i can imagine such a haunting, but sweet melody. Your song is beautiful. I finished my Painted Doll poem/song about Unys (LS). I recently went to my school's musical production of Jekyll and Hyde and came away inspired to write my own version of the confrontation between the two. The lines in italics are sung by Hyde, the rest by Jekyll; in the final stanza they both sing at the same time. Who is this stranger I see in the mirror? Who is this stranger who looks through my eyes? Who is this stranger who knows me like do? Who is this stranger who within me hides? The situation with Jekyll and Hyde reminded me of Domick and Mika, so I then adapted the song for them. What have you done, now he’s set you free? How can you do this, take over me? My time has come now, don’t you see? How did it go wrong, going too far?